Coach Brittany huddles with the Banana Slugs. Audrey Bright and Nathan Plumlee go on defense. Score! The Slugs celebrate a bucket. The ball bounced through the hoop, a whistle shrieked, fans whooped, and the coach leapt into the air. High-fives and fist-pumps went around as the scoring team hustled back down court to set up its zone defense, arms up, knees flexed. There was the usual air of competition you'd expect of a basketball game in a high school gym on a bright, sunny Sunday morning. 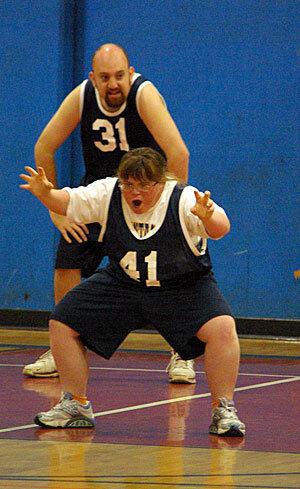 But for the Banana Slugs Special Olympics basketball team, winning the game was less important than playing in it. For these athletes--who have developmental disabilities such as Down syndrome--every step is a jubilation, every basket a triumph. 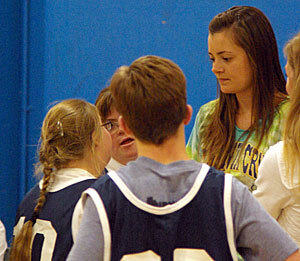 And for Coach Brittany Guest, 23, a fifth-year UCSC health sciences student who's volunteered coaching Special Olympics her entire college career, it's all about heart. "My team is so huggy and lovey and adoring," said Guest, who directs the Special Olympics program for the Santa Cruz area. "They just want to play with you and laugh with you and adore you. They're beautiful people inside and out." The hoops game on Sunday against Santa Clara had a special poignancy--it was Guest's last. This is her final year of coaching, since she graduates in June. The Huntington Beach native signed up to get involved with Special Olympics at the first OPERS fall festival she attended when she came to UCSC. "I went to my first bowling practice and fell in love with it, and ended up staying five years," Guest said with a laugh. 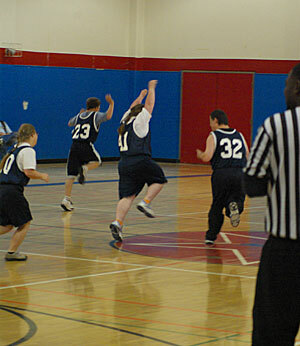 Special Olympics Northern California offers bowling in the fall, basketball in the winter, and track and field in spring. The program gives participants physical exercise, but it also gets them out and about, said Cindy Blyther, sports manager for Special Olympics Northern California. "It gives them something to do and provides the feeling of being part of a team," she said. "Also, it offers opportunities to interact with people and learn social skills." The Santa Cruz Special Olympics program is unique because it's the only student-run program in Northern California. Guest is a rare volunteer, said Blyther. "Some college students come out for a practice or two but rarely for an entire season, let alone become head coach," Blyther said. Guest said she's learned a lot from the Special Olympics participants. "They are so loving, and they are so welcoming," she said. "You could have purple hair and be pierced in 20 places on your face, and they would never think twice about passing judgment on you. It's an incredible human interaction that I don't get with many other humans." Assistant Coach Claire Love, 20, a sophomore in the health sciences program, is poised to take over for Guest. "It's a lot to take on, but I'm excited," said Love. "All the players are so happy to be at the games. The excitement rubs off on me. It's so inspiring." Guest will be missed, though. 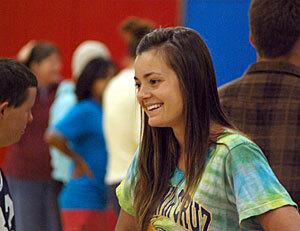 "Oh my goodness, everyone's going to miss Brittany," said parent Linda Bright, of Santa Cruz. Her daughter, Audrey, 20, has played with Guest during all of Guest's time coaching. "When you're a Special Olympics coach, you deal with everything--their medical, their emotional, their handicap," said Bright. "It's just amazing to take that challenge on. Sometimes I don't even know if parents understand how incredible the people are who do this." "The coaches make a special bond. They do," agreed Michael Bright, Audrey's dad. "I love Brittany!" exclaimed Banana Slugs player Leah Radach, 27. "She's a nice girl." "She always gives me smiles," agreed Allison Orr, 23. "She's a nice coach. She told me to do sports. I work very hard in practice, walking and passing and shooting." Players at Sunday's game ranged in age from their teens to their 40s or 50s. Men and women played together, with the referee gently guiding them at times. The Banana Slugs emerged victorious, beating Santa Clara 24-10 in a decisive win. "Sports gives them them a good social structure and helps them gain confidence," said Michael Bright. "And it gives them exposure to people like Brittany, who's wonderful." "They take it very seriously," said parent Suzette Birnbaum, of Soquel, mom of player Teddy Parelius, 13. "A lot of times, even if they don't win, they feel like they're winners."